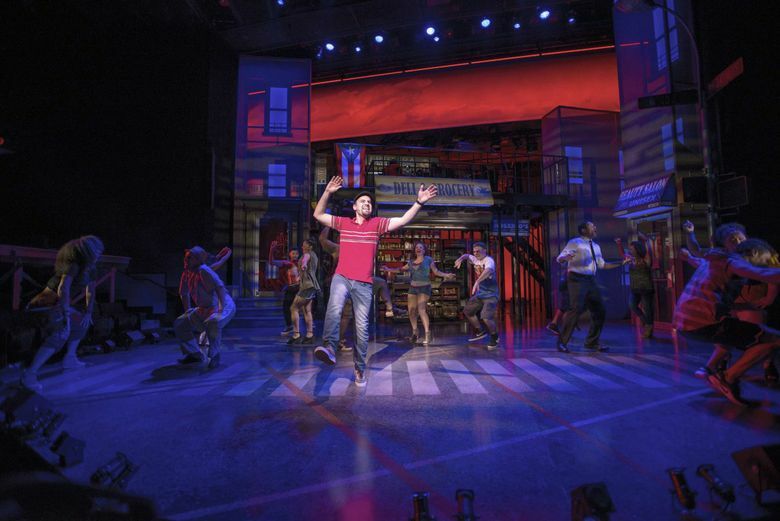 Lin-Manuel Miranda's Latin pop/merengue/hip-hop musical, about a Dominican-heavy corner in northern Manhattan, radiates an atmosphere that's attractive, convivial, comforting. You can slip into it as easily as a favorite pair of dancing shoes. Seattle’s most succinctly poignant review of “In the Heights” happened on a sidewalk, and probably lasted 40 seconds. Three chipper college students walked out of Seattle Repertory Theatre, lightly tripping over themselves while trying to merengue their way toward a short, yellow school bus and sing the chorus of “Carnaval del Barrio” from the second act. When I asked where they were headed, the driver pulled out his earbuds, smiled and said they were bound for the University of Puget Sound. The dancing students, the cheerfully matter-of-fact bus driver marinating in his own private soundtrack: After the musical, the scene seemed like an accidental epilogue. Lin-Manuel Miranda’s ebullient 2007 Latin pop/merengue/hip-hop musical, about a Dominican-heavy corner on West 183rd Street in northern Manhattan, radiates that kind of atmosphere — attractive, convivial, comforting. You can slip into it as easily as a favorite pair of dancing shoes. Miranda is a genius at quick, insightful character sketches (a one-liner here and a malapropism there speak volumes), and “In the Heights” draws soulful portraits of so many: the adult orphan of Dominican immigrants running the corner bodega, the loving but financially fraught couple running a taxi business, the old grandma who reminisces about Cuba, the neighborhood beauticians who act as a word-of-mouth neighborhood newspaper, the young woman who is the first in her family to attend college. In the moments after you leave the theater, its conventions of universal geniality bleed out into the street, where everybody’s got a story. In a 2013 interview with Northern Manhattan Arts Alliance, Miranda said “rule number one” of writing “In the Heights” was to be a kind of anti-“West Side Story”: “No one’s going to have a knife. No one’s going to be from the ’50s. And no one’s going to be a gang member.” No drug dealers, no cops, no turf wars: “In the Heights” looks at more everyday, domestic concerns — and gives them high drama, on their own terms. In fact, the show’s only quasi-aggressive gesture comes just as the lights go down, when Graffiti Pete (UJ Mangune, who can dance like lightning) quick-steps onto the stage wearing a bandanna over his face and points his spray can at the audience, writing a quick burst of graffiti on the fourth wall between him and us. The message is clear: We’re in his world now. 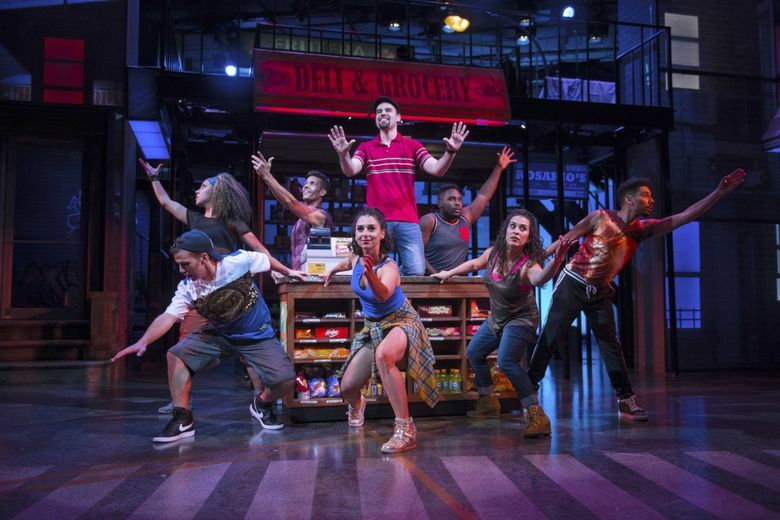 The rest of “In the Heights” is pleasant candy, never too sickly sweet, but never too challenging. Which isn’t to say the regulars on the corner don’t have woes — mostly about love and money. Our hero Usnavi (the talented Ryan Alvarado, doing his best Miranda impression) wonders how he’ll keep the bodega open, and how to woo the neighborhood hottie Vanessa (Stephanie Gomérez). The college-returnee Nina (Sophia Macías, who has a sweet, gale-force voice) can’t decide how to tell her parents she had a rocky year at Stanford. Benny (a puckish David Kaverman) wants to become a big-time entrepreneur — and get Nina’s attention. But there’s nothing simple about Miranda’s musical influences. As with “Hamilton,” “In the Heights” is like walking down the street in the summer and catching a few bars of what’s tumbling out of everyone’s open windows, with Miranda’s brain as the eclectic, universal jukebox. Jennifer Lopez, the Fugees, pachanga, Boogie Down Productions, reggaetón and plenty of soaring, heartfelt solos that would feel at home anywhere in the American musical canon. Still, that can’t take away from the musical’s persistent undercurrent of warmth and cheer in the face of its characters’ challenges. Compare that to Seattle Rep’s 2017 adventure in ambitious musicals: “Here Lies Love,” David Byrne’s disco musical about Imelda Marcos. “Here Lies Love” was technically magical (the Rep had to unbolt hundreds of seats to make way for the immersive set) but ultimately cold, like an overproduced studio record. “In the Heights,” on the other hand, still pulses with human warmth a decade after its New York premiere. It even inspires some people to literally dance out of the theater.